Val: Do you remember the smell of the fresh air near the seashore? Can you describe, a forest that rumbles its trees after a summer rain? All that you hear and see goes right into your mind. All of our senses are connected with each other in our memories. When we feel at least one of them, our imagination brings the others. Sometimes, and even often, we can't see the object, but we can hear it! You can't see the wind, but you feel it and hear it! The bird is singing. You can't see it hiding in a bush, but you hear a beautiful song and can define the direction it comes from. Albert: As you probably know, we are in a stage of polishing all the possible aspects of the game. We have to tweak some behaviour of the entity in order to make it act more mechanical, but overall, the possibilities that sound design can bring to the game are really interesting. Compare the simple shooting of the cannon in the actual version with this proof of concept with all those details in rotation and loading. Of course this level of detail complicates the work a little bit, but I'm convinced it's worth it. We are also working in parallel with Ernestas, who is improving the look of the enemies. 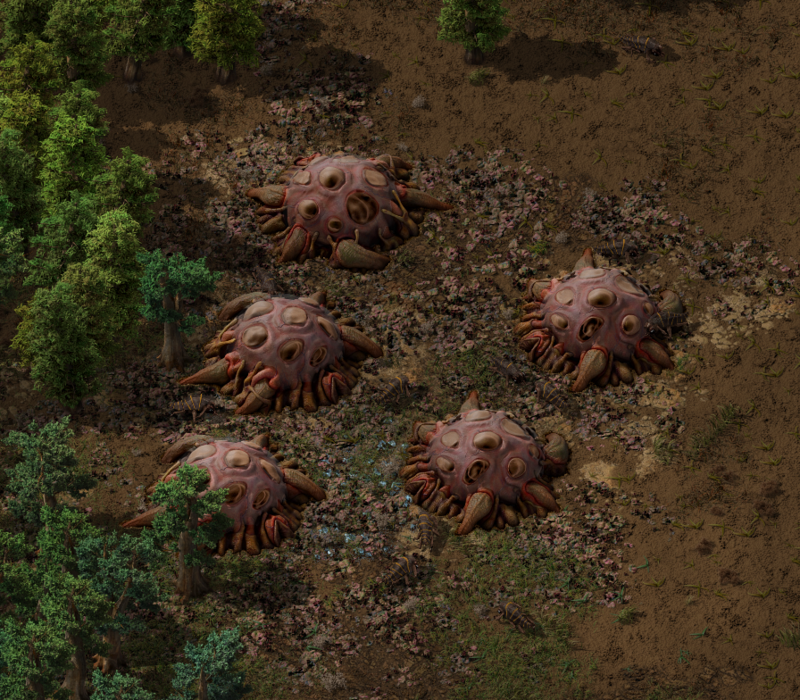 Right now we can show a sneak peek of how the new spawners look in HR. Together with TOGoS, we are working in a more specific map generation in order to improve the composition of the nests. The intention is to generate a special ambience for those areas that makes you feel like you are in enemy territory. Everything here is a work in progress, let us see how we end up with all those plans. Soon I'd like to show how the nests look with the animations, the ambience, and all the biters and worms around. Factorio has had a Map Editor since the early stages of development. It was initially used to create the current campaigns and scenarios, and from time to time we would use it to help diagnose desyncs. However, as development continued the Map Editor seemed to have been forgotten. Inside the Factorio engine, almost every game GUI/action is associated with the player that is looking at the GUI and doing the action. This makes sense because when the game is running everything is done by a specific player, and GUIs need to know stuff about that player. When actions are processed the game applies them to a specific player in the world, and handles stuff like multiplayer syncing of actions done by different players. In the Map Editor there is no "player" - there is just the editor - and this has caused a massive divide in what the editor can do compared to the main game. Because the Map Editor has no 'player' it can't use any of the action processing logic the normal game uses, and instead uses a large copy-paste of the action processing and attempts to apply it to the map knowing there's no player associated. This 'works' for the most part, but some actions are inherently tied to a player and simply don't work in this disassociated context. Having this split of 'game' and 'editor' means we had to essentially write any action processing logic twice: once for the game, and once for the editor. Most people skipped the second part and so the editor fell behind. From time to time someone would report a problem with it, or ask if we could add some new functionality (or even if it could just do what the normal game could do). The internal joke was always "Nobody uses the Map Editor" to explain-away why it was so lacking. When 0.17 tasks where being assigned, the topic of the Map Editor was brought up and I (Rseding) indicated I would be interested in working on it. Knowing what the problems where and how I wanted to go about fixing them I started. Several months of work (and several false-starts) later, I now have a 90%-there new Map Editor. I removed the separation of 'normal game' and 'map editor'. The Map Editor is built right into the standard game logic. Anything the normal game can do it can do automatically. For those familiar with Factorio's modding: it's a new controller like the 'god controller', called 'editor controller'. The standard interaction mechanics of the normal game 'just work' in the Map Editor (Hotkeys, QoL shortcuts, Pipette tool, etc.). The Map Editor can be toggled on and off while playing any game. You no longer need to save, exit the game, go to the map editor, convert-save-to-scenario, and then finally load-in-map-editor. You can just be playing the game and switch to the editor (and back). The Map Editor is multiplayer compatible: It doesn't make any distinction between singleplayer and multiplayer - it just works for both. The Map Editor can pause/unpause the normal entity update but still interact (in multiplayer as well). Non-map-editor players are frozen in place but can still talk, switch to/from the editor, connect, and disconnect from the game. The Map Editor is King. Anything you want to do, it lets you do (if I thought of it), at no point during development did I decide "No, you just can't do that with the editor - it would be too powerful". The point of it is to be powerful. Extending the force-editor to create/remove/edit forces fully. Extending the entity-editor to let you place entities on other forces than the defaults. Extending the decorative editor to have more fine-grain control of placing/removing without needing to know the exact decorative you're looking at. Controlling the simulation rate and controlling tick execution. Finally what I see as the ultimate request: "Ability to Copy & Paste an area from 1 map to another, transferring tiles/doodads/biters/trees/entities/items/...". The key part being "from 1 map to another" meaning "let me import stuff from other save files". I have a plan to make this work, but it will be restricted to single-player only. Still, I can see it being incredibly powerful when finished. In summary: there is still more work to be done but the new Map Editor is coming together amazingly. I'm looking forward to what people will create/do with the new power the new Map Editor will bring. For us it will greatly speed up the work on the new campaign maps.